Sergeant Cecil Anderson MID and Lance Corporal Geoffrey Fritz MID were two of the 27 soldiers who died during this conflict, and the only ones to be awarded a 'Mentioned In Despatches'. A soldier 'Mentioned in Despatches' (or Dispatches) (MID) is one whose name appears in an official report written by a superior officer and sent to the high command, in which is described the soldier's gallant or meritorious action in the face of the enemy. Both Sergeant Anderson's and Lance Corporal Fritz's MIDs were awarded posthumously, and are on display in the Museum along with their medals and other memorabilia. 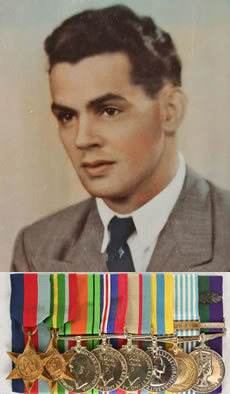 Seventy MIDs were awarded for Malaya – 34 for the Army and 36 for the RAAF – with Sgt Anderson's and LCpl Fritz's the only posthumous awards. Note: Regarding the award of the MID, in the Imperial system in place at the time, the Victoria Cross and a MID were the only awards that could be conferred posthumously. If an act of bravery occurred in which a serviceman who survived would have received a Distinguished Conduct Medal or Military Medal, one who was killed would receive nothing or a MID. This left many brave men unrewarded, but thankfully this system has now been changed. Educated in a Bundaberg orphanage, Charlie was an aboriginal farm worker when he enlisted in the AIF in Gympie. He served in the islands with the 2/2 Independent Company. On discharge he worked as a fencer, iron worker, brewery hand and trawlerman until he volunteered for service in Korea with the 3rd Battalion, Royal Australian Regiment. Charlie returned to Australia in May 1952 and remained in the army as an instructor – mostly with National Service intakes. On the 30th October he embarked for his third war  this time as Platoon Sergeant of 2 Platoon, A Company 2 RAR for service in Malaya. It was during his Platoons' first contact with Communist terrorists on 4th March, 1956 that he was mortally wounded by Thompson Sub-machine fire. As a result of his 'courageous leadership' he was posthumously Mention-In-Dispatches (MID). Geoffrey and his twin sister were born to share farmer parents in Kingaroy on 4th May, 1935. He attended Kingaroy schools until his parents moved to Maryborough for his father to work at Hyne and Sons sawmill. 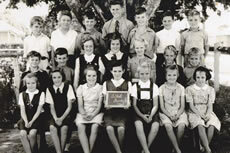 Here Geoffrey attended Albert State School, but more changes in his father's employment saw the family eventually moving back to the farm life at Nanango. Geoffrey's first job was with a house removalist in Kingaroy and later farming at Tansey, where in 1954 he was called up for National Service. He joined the Regular Army immediately after completing his National Service and was posted to A Company 2RAR. He was killed in action in Malaya on 22 June, 1956. Read a personal account of his service in Malaya by Lieutenant Colonel Harry Smith SG MC who was posted to Korea 1954 but that was changed to 2RAR Malaya and he served two years in the Malayan Emergency as 9 Pl C Coy Commander 1955-57. Keith Payne VC AM served with his unit in Korea between April 1952 and March, 1953. He also served in Malaya in 1965. Read MALAYAN MEMORIES by Harry Smith. More about Harry on the Long Tan page. More about Keith Payne VC AM. More background and photos from the Australian War Memorial.